This fireplace mantel was created in the Arts and Crafts style for a very discerning customer who wanted to maintain a stylistic consistency through out his very early 20th century home. 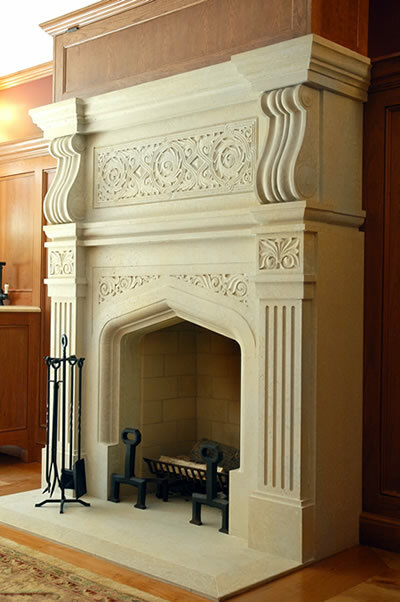 This fireplace mantel is carved in a beautiful beige limestone from Minnesota to compliment a warm oak paneled room. Walking through New York City you may notice similar stone carving designs on many brownstones. This style was very popular during a booming period of development in New York City. This is a very unique fireplace mantel because the of tudor style firebox opening which is particular to gothic fireplaces. DMS Studios Ltd. was able to combine these two very elegant styles into a coherent and handsome limestone fireplace mantel.